C had been hearing good things about The Water Poet for a while; it's got a bit of a name amongst Londoners in recent months for good food, good booze and a whole load of good events, which left her keen to try it out. Unlike many of its neighbours, this Shoreditch pub's popularity seems to have extended beyond the locals - go in here, and you're sure to find a real mix of customers (although interspersed, of course, with your average Dalston hipster or two). A and C had been intending to pop down to The Water Poet for several months; it's not too far from where A lives, and they're frequent enough visitors to that part of town. They'd also heard good things about the special events this place puts on, including a street party for the Queen's Diamond Jubilee earlier this year which they tried but failed to get to and a semi-regular underground cinema, decked out with bean bags and cushions. Arranging a weekend meet-up with her friend L, then (aforementioned on the blog here), C suggested heading down to The Water Poet for a spot of Sunday lunch. The prices looked reasonable and she couldn't help noticing the website's proclamation of their Sunday lunch as "legendary" - quite a promising (and confident!) statement, then. 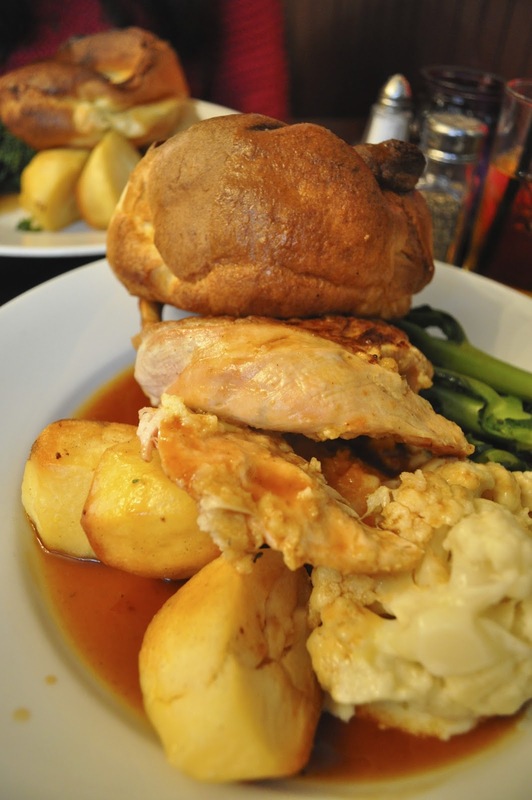 Apparently not ones to boast unduly, Time Out and TopTable also voted The Water Poet "Best for Sunday Lunch in London" according to the pub's homepage. With a table booked and our stomachs rumbling, we were very excited to try it out. Let's start with the real positives, here: the pub is lovely. It really is. It's cute, quaint but unpretentious: a really charming combination to find in Shoreditch, and it's the kind of place you could imagine spending many a lazy Sunday afternoon (or a boozy evening). The service, too, is very good. Although a little slow at peak times (perhaps understandable, given the capacity of diners here), the waitresses in here are all very friendly and put you immediately at ease with jokes and chatter. 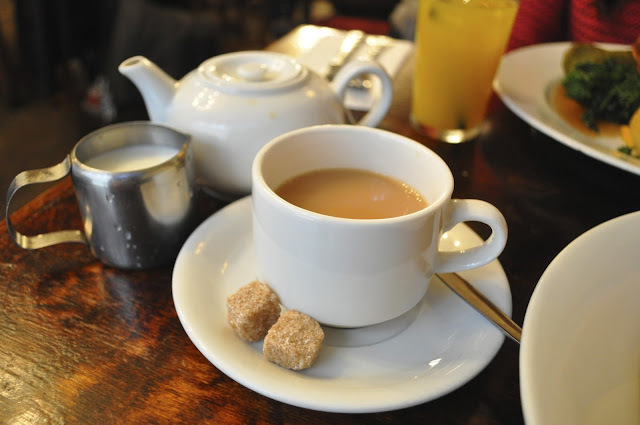 C was also pleasantly surprised to avoid getting a strange look for ordering tea with her roast dinner; customary for her - a weird quirk, if you will - it's often greeted with disbelief or disgust, but here went down with just a sweet, surprised smile. Unfortunately, while the pub itself and the service was excellent, the same can't be said for the food. Both C and L left feeling ultimately quite disappointed in what the 'Best for Sunday Lunch in London' actually entailed. 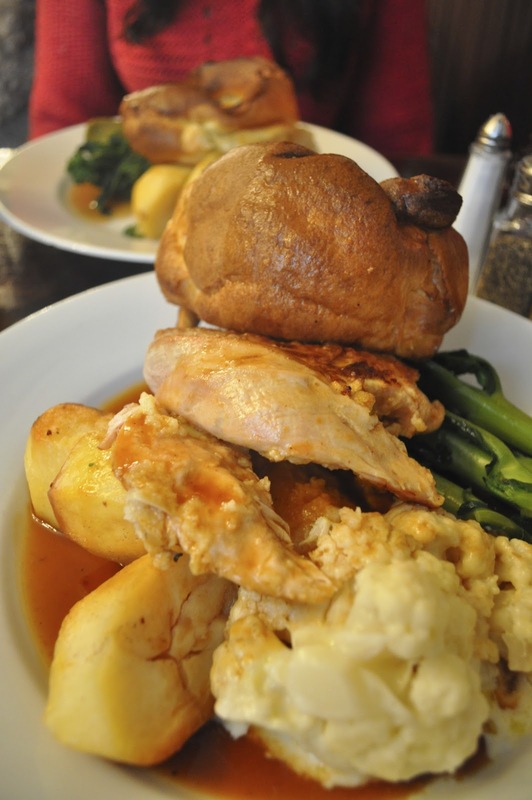 If there's one thing we know how to cook, it's a good roast dinner with all the trimmings. 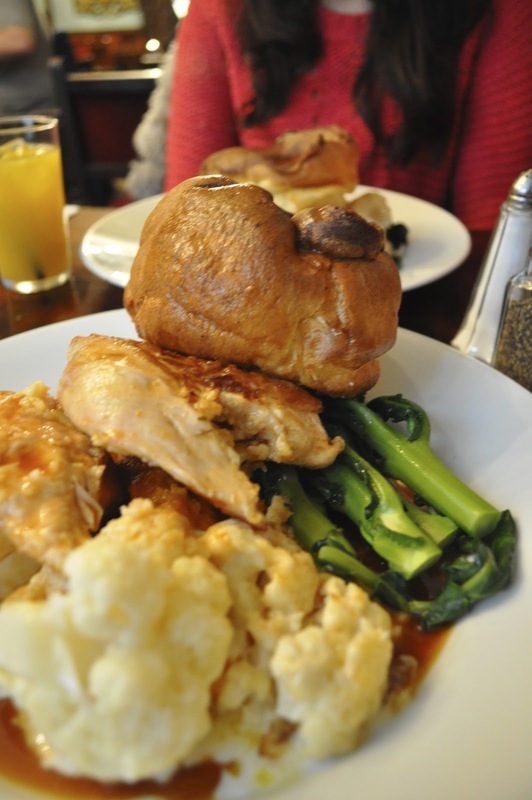 We've also been to our fair share of Sunday lunches (we've worked our way around most of the good quality pubs in Brighton over the course of five years, for a start), so we know what to expect from a decent roast. What we got, though, was a lukewarm, undercooked plate of food - leaving us both dismayed. C ordered the half a roast corn-fed chicken with stuffing, and the meat itself was admittedly was cooked to perfection: it was beautifully tender and had a good flavour to it. Similarly, the veggie sausage which made up the main part of L's plate was very enjoyable: although not the most aesthetically pleasing food (we won't detail what they reminded us of), the sausages had a crumbly texture and were full of flavour. The cauliflower cheese was also well done, and the swede was good, albeit rather too mushy. The rest, though, was frankly a bit of a disaster. The broccoli was so undercooked that it was absolutely solid from stalk to tip; the potatoes were so overcooked that they were like hard bullets the whole way through, and even after going at the skin with a knife for several seconds it was still impossible to cut through. 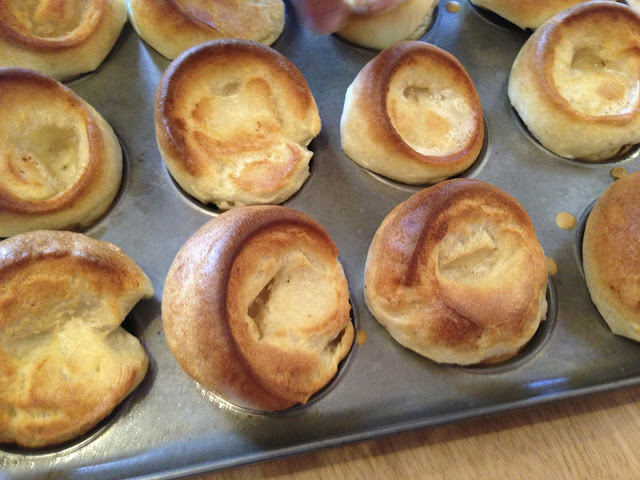 The yorkshire pudding was stone-cold; there was a serious lack of gravy (so much so that we had to ask for some) and the whole dish was generally lukewarm at best. All in all, this was really quite disappointing, and especially after the write up and boasting on the website and in various publications. Had the dish been as good as promised, we wouldn't have had any qualms about paying £12 a head for the main; however, as it was, we were left feeling a little cheated at the very poor value for money. 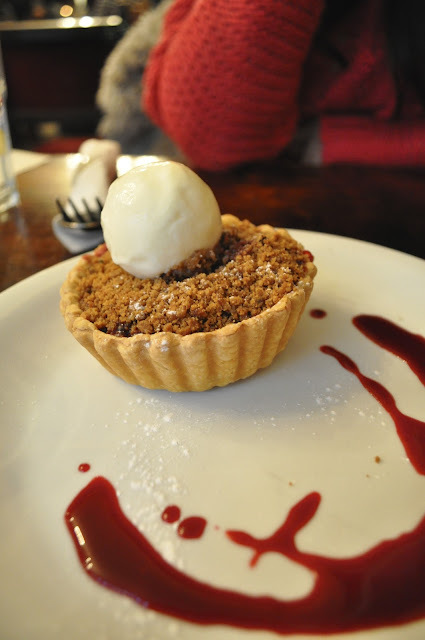 After a disappointing main, we decided to cheer ourselves up with a dessert, and so ordered the Plum and Autumnal Berry Crumble with clotted cream ice cream (lovely Jude's, for any of you familiar with the West Country!). Admittedly, this was very good and went a little way at least in making up for the main course dismay: although seemingly bought in rather than made in the kitchens, it was nonetheless flavoursome and pleasingly sharp.